HG-08 dyeing auxiliary automatic weighing system(Automatic Dispensing Machine for Textile Dyeing Lab) can combine with PLC and electronic scale, to achieve automatic weighing of liquid auxiliaries. 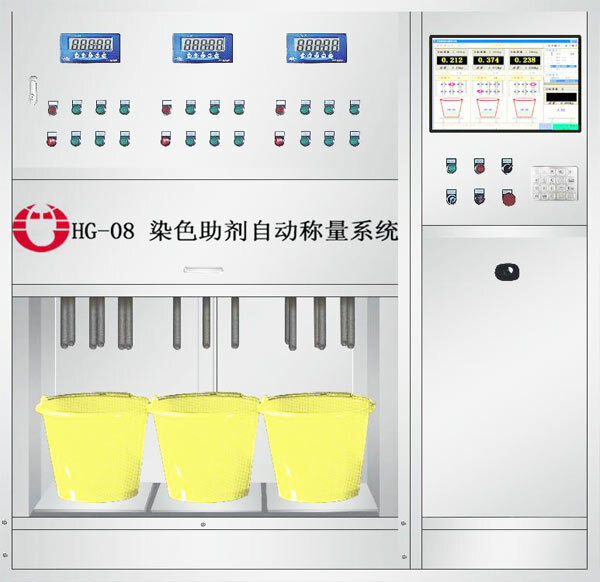 It can also be used alone or together with the "HG-10 dyeing enterprise management system" developed by the company. It can achieve a comprehensive monitoring and management on the technical formula, material requisition and weighing process. This system is also equipped with automatic weighing powder auxiliaries. HG-08 dyeing auxiliary automatic weighing system is applicable to the dyeing and sizing workshops, to solve the problems such as inaccurate and wrong weighing of auxiliaries, great error of weighing and waste of auxiliaries during the auxiliary receiving, weighing and transport, to achieve orderly picking, reduce the loss of auxiliaries and lower the dyeing costs. ●The weighing unit is stainless compete structure, corrosion-resistant and easy to clean. Weigh materials at the same time, thus improving weighing efficiency. The weighing process is completely automatic, fast, convenient and exact. The indicator light and the sound alarm will give instructions and avoid weighing materials wrongly. ●The materials requisition list is worked out by computer in terms of technique prescription, which can be printed. Every material requisition list has different barcode automatically produced by computer. The barcode reader will scan the barcode of material requisition list, displays the content of the material requisition list in the system and automatically weighs material according to its weight. ●It has the function of detecting the location of material weighing bucket. ●It has manual/automatic weighing functions, convenient for operation. ●The whole process is recorded in details and convenient to check. It is sorted in terms of day and month.